When it comes to shopping for pendant lights, it’s important to know your options. These luminaries can be used for task, mood, or decorative lighting, and they’re a unique alternative to traditional chandeliers. Fortunately, pendants come in plenty of different designs – and each one can help complement your personal sense of style. Lantern pendants offer an openwork silhouette with clean lines and glass panels, and they work particularly well in transitional and contemporary spaces. Globe pendants can instantly soften a room with sharp angles, and they’re a great way to create a cozy setting in a living room or bedroom. As the name suggests, island pendants have long, linear structures, ideal for placement over rectangular structures. Schoolhouse pendants are similar to bell/urns, but they feature characteristic bell-shape curves that add visual interest. Drums are versatile enough to work in big and small spaces alike thanks to their compact shape and range of sizes. Stem pendants are fixtures attached to slender tubes, and they’re good at accommodating challenging spaces like oddly shaped foyers or hallways. These designs are typically very narrow or wide, and many are adjustable to help you position them horizontally or vertically as you wish. Go retro with a Sputnik-inspired pendant. 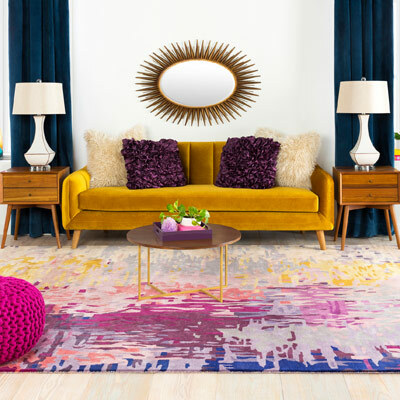 This mid-century modern style is a showstopper and works well in wide spaces. Urns and bell-shaped pendants are another versatile option that draw the eye up with their soft, graceful curves. These designs suit smaller spaces. Bowl pendants are time-tested popular options for gathering areas in a home. With their ability to diffuse light, it’s ideal for providing overhead lighting. Mini pendants suit small spaces just fine. Use these over side tables, or group them together for a big statement. Make a great first impression with foyer pendant lights that really pop. The main thing to consider here is how your entryway fixture will flow with the rest of your home’s décor. You’ll want to select a design that introduces visitors and guests to your preferred aesthetic and serves your entryway well. Open-cage lantern designs are a contemporary favorite, while starburst pendants and glitzy sparklers can add their own vintage-inspired charm. Let one statement piece do all the talking, or group a collection of pendants near your front door for a dazzling spectacle that’s sure to delight. Pro Tip: Check out our “Modern Pendant Lighting Look Book” for a wide range of contemporary fixtures. Set the stage for entertaining family and friends with a well-lit living room that’s as stylish as it is cozy. It’s not uncommon to change things more frequently in this particular room, as you might replace your furniture or paint an accent wall. Because of this, neutral designs are a great option and can serve you well for years to come. Whether you love crystal fixtures that shimmer and shine or modern designs made with fluffy white goose feathers, a basic color palette or metallic finish will complement your ever-evolving style. The kitchen has its own unique lighting needs, and pendants are a great way to brighten your culinary workspace to perfection. Pendants with adjustable heights are an excellent choice above islands, carts, or dining areas, while grouped pendant lights placed at varying heights can illuminate a space with distinct style. Use these pendants alongside other types of lighting for smart and strategic light layering. Pro Tip: Browse “Secret Pendant Lighting Techniques to Improve Your Kitchen” for some swoon-worthy before and after shots. Dine in style beneath the signature beauty of pendant lights. There are so many ways to make pendants work above your dining room table, so feel free to think outside the box. Unique designs look exceptional here and help generate dinner conversations, while grouped mini pendants can lend their own elegance and charm. You’ll want to make sure the pendant you choose is in proportion with the size of your dining room table and illuminates the entire space accordingly. Also, consider using dimmer switches to help you change the lighting for different occasions. Your bedroom is your sanctuary, and pendant lighting can turn it into the sanctuary of your dreams. Whether you love colorful fixtures, soft metallic hues, or beaded designs with bohemian appeal, there’s a pendant light for any space. Go bold with an eye-catching design hung at the foot of your bed, or use a decorative mini pendant over a nightstand for a creative way to free up table space. Think bathroom lighting is limited to sconces, bath bars, and vanity lights? Then it’s time to reconsider the pendant. These streamlined designs work beautifully alongside bathroom vanities and mirrors, and they add their own charm to master bathrooms, powder rooms, and guest baths alike. Just be sure to choose fixtures that are specifically rated for damp locations. Pro Tip: Read “Wake Up Beaming with the Best Bathroom Lighting” for more ways to brighten up your master bath. Your home office should be a place of productivity, so decorate it with the lighting it deserves. Pendants are a lovely way to brighten up your desk space and boost your workflow. Downlights provide ample illumination, but don’t be afraid to try a creative or whimsical style that reflects your personality. Fixtures in shades of black, white, and gold look especially polished and are an excellent choice if customers and colleagues will be seeing the space either in-person or via skype. Create lovely transitions throughout your home with hallway pendant lighting. These luminaries brighten up walkways with ease and help create a cohesive presentation from room to room. Oversized pendants can work well in large hallways with tall ceilings. Otherwise, consider smaller designs that won’t overwhelm the space. These fixtures can be hung in a coordinating series down a long corridor, or they can stand on their own in small walkways or even walk-in closets. Pro Tip: Check out “7 Unexpected Places to Hang Pendant Lights” for other creative placement options. Your home’s exterior is just as important as what’s inside, so make sure your outdoor lighting is up to par. Illuminate your deck or patio with pendant lights that are rated for outdoor use. Lantern-style pendants work especially well outside, as do seeded-glass shades and two-tone combinations of metal and wood. Pro Tip: Check out “All You Need to Know About Pendant Lighting” for more tips on choosing the perfect style for you. Pendant lights are a brilliant way to turn a house into a home. Illuminate each room with the designs that speak to you, and brighten up your space with lighting essentials from our complete pendant collection.